Description: VIA Rail Renaissance passenger shells are broken up by Harbour Metals in Thunder Bay, ON. for recycling. The shells were purchased from the UK and never used. Description: CN 5621 sits at the west entrance to the Belleville Yard. The yard has undergone some reconstruction and sections of track lay about. Description: CN 5633 approaches the container terminal on the right. The waterfront yard is under construction with several of the sidings removed to make room for a new road through the yard. New sidings are being laid just to the left of the new roadway. Halifax's busy and scenic harbour dominates the back ground. Description: Photo of the Dartmouth CN Yard, taken from the MacDonald Bridge. The yard is beside Halifax Harbour and supplies the autoport and refinery's on the Dartmouth side of the harbour. There are two engine tracks on the right a maintenance track, collection tracks and an area to "run around". 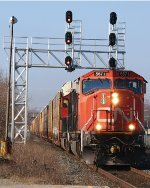 Description: An auto rack train headed by CN 5671 drives past the signals entering the Belleville CN Yard. Description: Sitting idle in the Belleville, Ontario yard waiting for the next job. Description: VIA passenger train consisting of a baggage care and five coaches, heading east on the CN main line towards Brighton, Ontario. Description: Early morning in the belleville yard. Description: A long string of CP and one STLH engines sit at the Sudbury Diesel Shops.